9/11/2001 – I remember I was on the phone being interviewed for a job out of state, and I had the Today Show playing in the background. I looked up at one point and noticed the surreal scene that was the beginning of what ultimately played out before all our eyes. I told the client I’d have to call her back, but I don’t think I ever did. I got lost that day. I called my wife who was out shopping and tried to explain what I was watching. She came home and we watched it together. We picked our kids up from school since they let them out early, and brought them home and tried to explain. I could go on, but really the rest of that day is still just a blur to me. I can’t even begin to imagine what it was for the victims and their families. So much has been said about the horror of that day, I’m not going to add to it here. I leave that to the writers who are far more eloquent than I am. 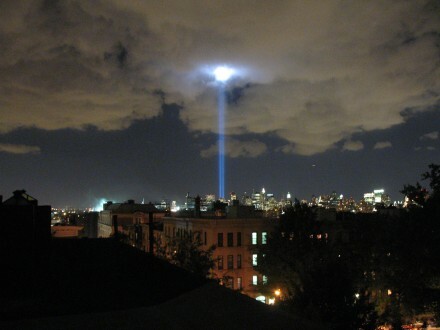 I really wanted this entry to be more about my thoughts on what I consider to be, the very fitting Tribute In Light. Aside from the emotions it brings back from that day, there’s something both fascinating and eerie about the concept and the design that I like very much. I’ve always been interested in lighting design, having started with it on the stage in high school. In the homes I build, lighting has always been very important to me (usually more so than it is to the client), so I can appreciate the challenges. The Tribute is a simple, understated design, but often the best design is. And as always, there is a lot going on behind the scenes to pull this off that we never see in pictures. Anyway, I think it evokes the right emotions, and I think the designers got it right. If you want to read more about the Tribute, the Wikipedia article is here. There are tons of photographs all over the net, but so far I think this one is my favorite. It’s an amateur shot, and it’s very honest. The biggest collection of photos I’ve found is here on Flickr. I like the fact that after the first year, they settled on 24 hours only, but I don’t know what will happen to the Tribute in the future. As far as I understand, next year is supposed to be the last year, but they said that in 2008 and it continues on. I hope they keep at it…for me it’s very fitting. I was there on 911 in the thick of it. It is a day I would like to forget but can’t as I am constantly reminded of it. I had friends and colleagues that didn’t make it. I consider myself fortunate as an unknown force made me late for a kick off meeting for a new construction project in Tower 1. That delay saved my life as I was 3 blocks away from the WTC when the 1st plane hit. Thanks Dad ! I was a volunteer EMT at the time. I went into the city two days straight and sat on a bus at a staging area for 8 hours with a bunch of other EMT’s and doctors. We were all waiting to help, but unfortunately there was no one to rescue. Very sad, those two days.